You’ve probably already considered building a separate structure on your property as a standalone workshop space. Having a large, dedicated building for project work is a dream for many. Did you know that these structures don’t have to break the bank, and if you want to, you can even construct the building yourself? 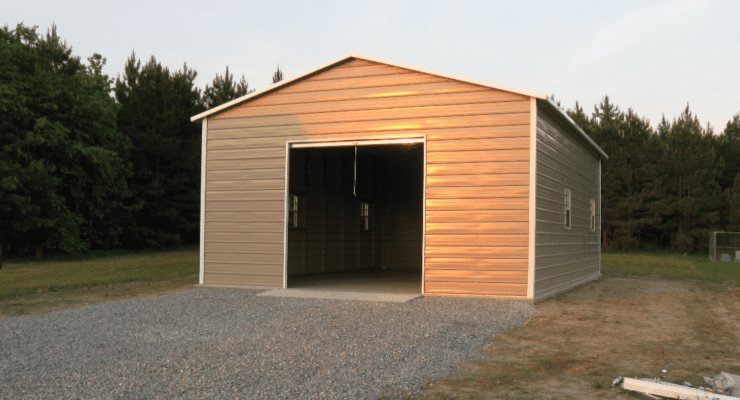 Indeed, there are many great reasons to build a new workshop from one of our garage plans here at Newmart Builders, and affordability is a major one. Let’s take a look at how you can create the ultimate home workshop on a reasonable budget in just hours or days with a durable steel structure. In a previous blog post, we discussed some of the primary decision points involved in choosing the best structure for your needs. All of these assumed that you wanted to expand beyond the walls of your home to create more storage space to house things like garden tools, recreational vehicles, or even livestock. But external structures on your property don’t have to be used just for storage or as living space for large animals! Maintaining your active workshop space outside of your home offers a lot of benefits for both you and your family. The first that comes to mind is security, and along with that, safety. If your workshop is in your home’s basement or an attached garage, it can be difficult to keep out kids, family pets, and other individuals who really shouldn’t be accessing your shop. Having a locked door within your home may not be practical for various reasons, and your requests that family members ask permission before they enter the workshop probably go ignored. With an external workshop, no one will need to have direct access that you don’t want to allow since the shop is not in anyone else’s living space. And, if theft of particularly valuable tools or materials is a concern, you can easily install sophisticated security systems without so much worry about family members unintentionally tripping alarms. Forget having to clean up others’ messes before you can get started on your next project, too. And forget accidental tool breakages or worse, accidental injuries caused by inexperienced users experimenting with dangerous things like saws, knives, or power tools! Loud noises and chemical smells emanating from your workshop that your family may have complained about in the past also become less of a problem when moved out of your house. If you’re often staining furniture, painting, or working with lawn and garden chemicals, for example, an external workshop space is much simpler to ventilate properly than a basement or attached garage shop. By now you’ve probably seen lots of ideas for tricked-out garden sheds that people have turned into backyard retreats or beautifully organized workshops. These structures are often made of wood, which is adequate for many applications, and wood framing lends a classic look that some people prefer. But let’s look at the drawbacks vs. steel structures. First, wood buildings are generally much more costly to build because they require more skilled labor and time to construct. If you’re a hobbyist woodworker, you’ll understand – lumber must be cut to size, framing must be joined together, and holes must be drilled to run wiring, etc. before you can even begin to think about moving in. Additionally, wood buildings are vulnerable to problems like water and insect damage over time, as well as destruction by fire. When you build your new external workshop building out of steel framing and materials, you’ll save considerable money on construction costs, as even if you have no building experience today, you will be able to construct your shop either entirely on your own or with help from others. If you’re great at following written instructions, you can build a steel structure! All the framing, paneling, and accessories your building requires will be delivered with holes pre-drilled and pieces perfectly formed. No need to worry about whether walls will be straight or corners will match up in a steel building. And, it is well known that steel framing weighs about a third less than wood framing, so it’s much easier to work with even if you’re doing construction on your own. So, it’s obvious that a new steel structure is a smart choice for your dream workshop. In addition to durability and ease of construction that wins out over wooden buildings, steel structures require little maintenance to remain structurally sound over the course of decades. But once you have your new building constructed, how should you get it set up for years of enjoyable use? No matter what your favorite hobbies are, there are some universally great ideas for features you’ll want to add. Every shop needs a large, uncluttered workbench. And you probably already know what your dream bench would look like. Maybe you’ve assembled something close over the years, but if you were starting from scratch, you’d do things a bit differently. Before you move into your new workshop, take some time to design and create your ideal work surface with convenient places to keep frequently-used tools, storage for small items like fasteners (nails, screws, staples, etc.) on the bench top, and great seating and lighting, too. Hanging a magnetic bar (common in kitchens) on the wall above the bench to hold a variety of tools or small parts you don’t want to lose as you work is a great organizational helper you may not have considered before. 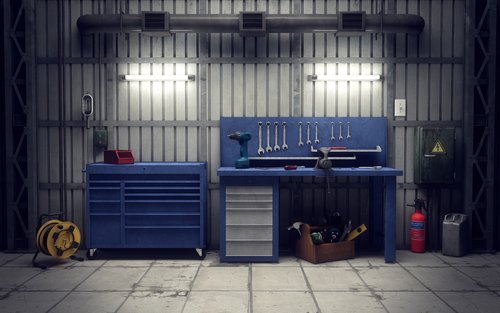 We’ve already mentioned adding storage solutions on your workbench for small items that you use frequently, or that might be easy to misplace, but you also need storage for large items like materials and supplies. If you’re a woodworker, for example, your storage demands are particularly significant. Lumber and sheets of paneling needed for building furniture can take up a lot of unnecessary space if they’re stored incorrectly. You’ll want to create bins, shelving, and vertical slot-type storage to keep your raw materials from taking over the area. Other storage features you may need include tool boxes, drawer units, and even those large plastic tubs with lids you can purchase from discount retailers – plastic containers with clear sides are particularly useful since you can see contents without opening any of them! 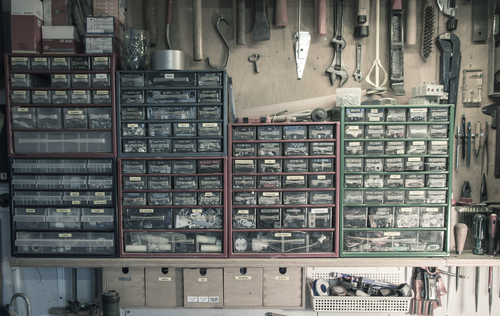 If you’ve created a well-organized workbench and other storage, it should not be difficult to leave some free space in your new workshop for activities that require it. Sawing lumber or setting up long pieces of trim or molding for painting would be a few examples of things that might require a lot of space. Having the flexibility within your workshop to set up different large-scale projects without much effort is extremely valuable. Do your hobbies create a lot of scrap material that you either need to store for future projects or dispose of? You know that these odds and ends can pile up and make for a cluttered workspace in no time. Before you even move into your new workshop, think about how you’ll stay on top of managing trash and extraneous pieces of material. Purchase large trashcans and place them in locations convenient to your workbench and other production areas. Line them with heavy-duty trash bags and resolve to empty trash frequently. This can take some discipline, but keeping a tidy workshop makes working on projects more fun instead of frustrating. One of the options you can choose with our buildings is skylights, and you can also incorporate windows into your enclosed garage plan. But what about other lighting? Depending upon your specific hobbies and needs, you will want to plan several different types of lighting options throughout your new workshop. From task lighting on and directly above the workbench to more general light for the building, you’ll want to consider installing a variety of fixtures. A tip from the pros on lighting – as you’re building and wiring your new workshop, seriously consider separate dedicated circuits for power tools and lighting. That way, if a breaker is ever tripped when you’re working with a high-powered machine, your shop’s lights remain on, which can be essential for safety. Have we enticed you into planning your new “ultimate” workshop yet? Here at Newmart Builders, we want to help you make your home and property the place you most love to spend your free time. Even if budgets are a concern, we offer a broad range of building options so you can create a new structure quickly and affordably. Get in touch with us today to talk about solutions to meet your unique needs.